My goal is to publish new posts twice a week — Mondays and Thursdays. However, if you don’t see a new post on Thursday, it’s because I was too busy, so please look for a new one the following Monday. No Thursday post this week because of a brief holiday. Hope to have a new post on Monday, but it might be Tuesday. Sotheby’s New York held its Important Tiffany sale on December 15, 2011, a day after Bonham’s New York held its 20th Century Decorative Arts sale. Sotheby’s separated its 53 Tiffany Studios’s items into one catalog and its Important 20th Century Design items into another. Continuing the excellent results for Tiffany Studios items, the sale totaled $4,597,875, with 83.0% of the offerings sold by lot and 78.2% by value. That worked out to an impressive average price of $104,497 per sold lot. 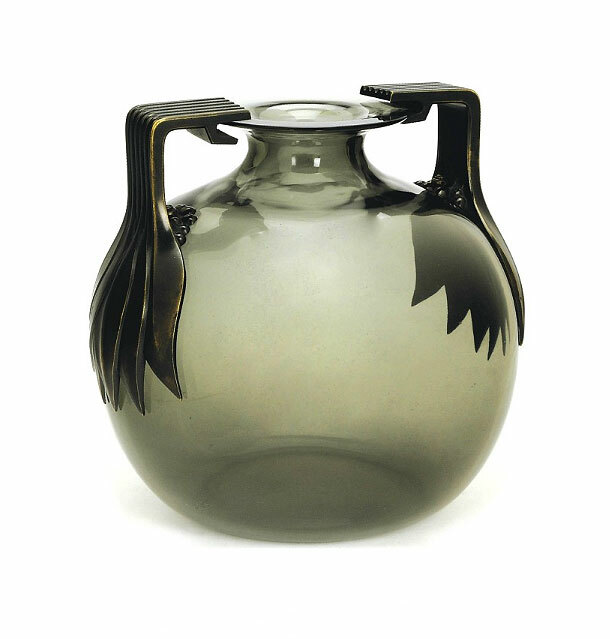 The Important 20th Century Design portion of the sale grossed $5,106,251, for a combined total of $9,704,126. 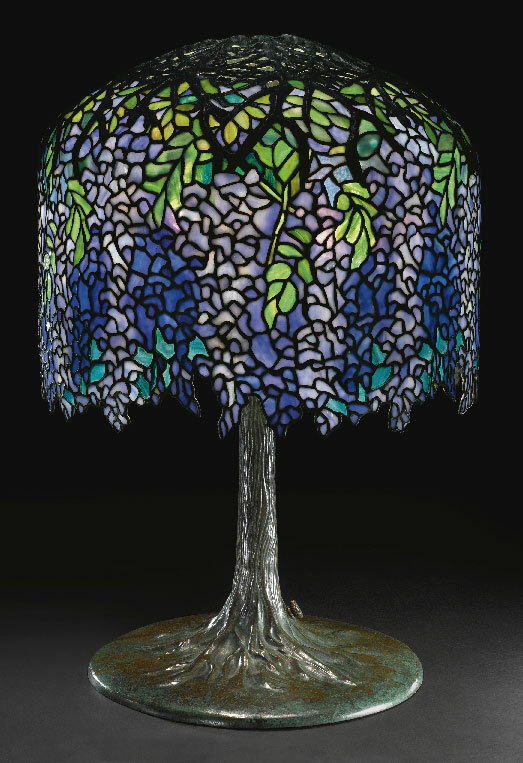 Top lot of the sale was #238, a beautiful Tiffany Studios Wisteria table lamp, which sold for $842,500, including buyer’s premium — well above the pre-sale estimate of $400,000 – $600,000. 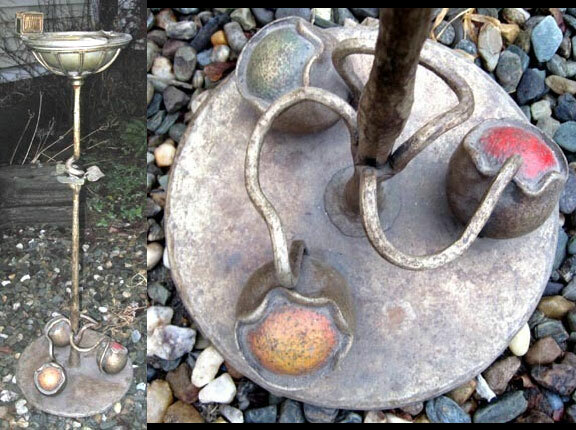 The most mystifying result of the sale was lot #231, a set of three relatively simple (except for the bronze balls) Tiffany Studios wall sconces. Estimated to sell for $25,000 – $35,000, they sold for an astonishing $182,500. Bidding slowed and almost finished near $45,000, when two determined phone bidders continued to duke it out to $182,500. Another happy consignor hit the jackpot! There’s no other way to describe it. 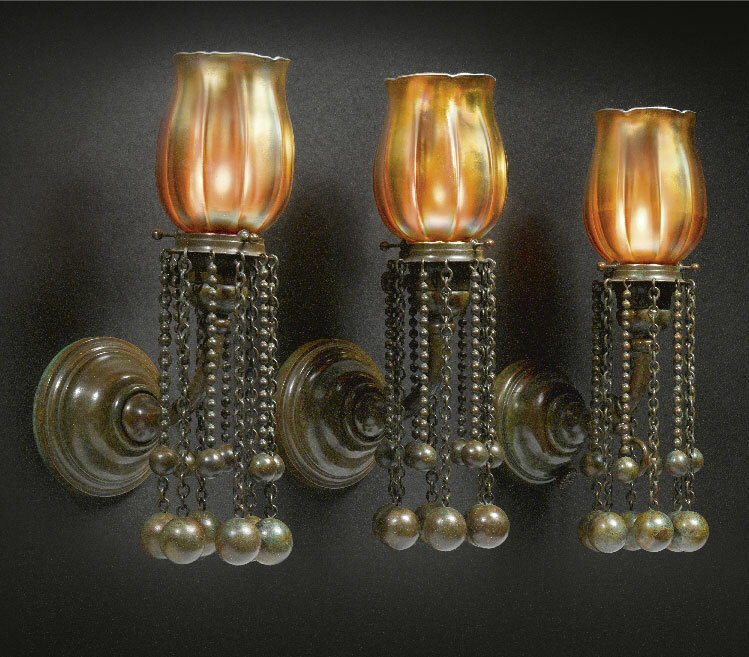 If I had displayed these sconces at a show and asked $182,500, I would have been laughed out of the show. Prices and interest have been steadily rising on original artworks by Tiffany. The current exhibition at the Nassau County Museum of Art in Roslyn, Long Island, NY, displays a vast collection of Tiffany artwork. (More on that in a subsequent blog.) 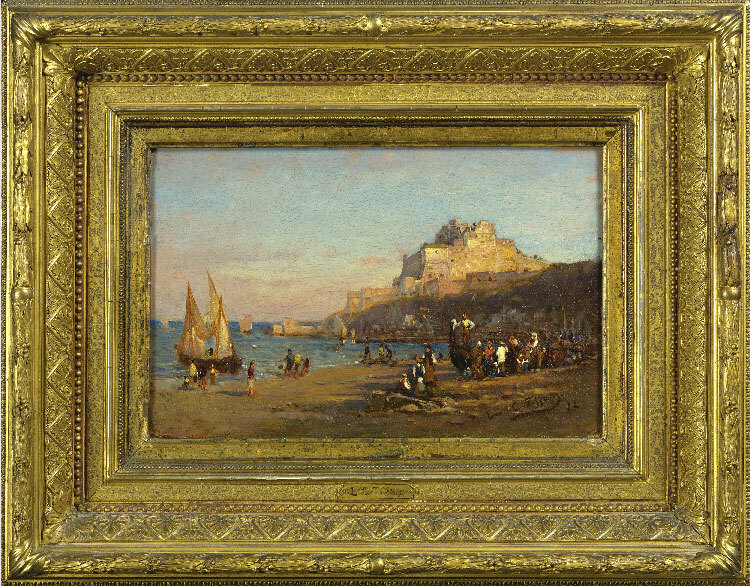 Perhaps that had some influence on the sale of lot #201, a small, original oil painting on panel by Louis Comfort Tiffany, of a Mediterranean seascape. Estimated to sell for $15,000 – $20,000, it realized $53,125. For the complete results of the Tiffany sale, click on the following link. Sotheby’s Tiffany results. 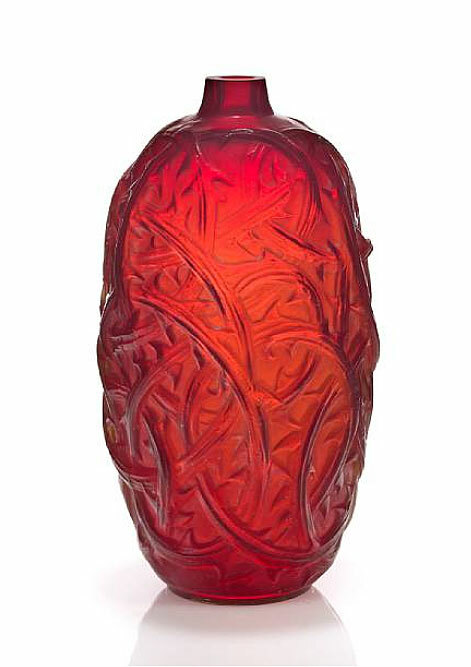 Bonham’s New York held its 20th Century Decorative Arts sale on December 14, 2011. The sale went well, with choice items and reasonably estimated items doing best. Lots with overly strong estimates and/or reserves either did not do well or failed to sell. Top lot of the sale was #3168, an Art Deco bronze and ivory statue by Demetre Chiparus, entitled “Clara”, sold together with a champlevé enamel pedestal. Aggressively estimated at $100,000 – $200,000, it sold for $98,500, including buyer’s premium, below the low estimate. That meant that the reserve was set lower than the low estimate. By New York State law, the reserve cannot be set higher than the low estimate. 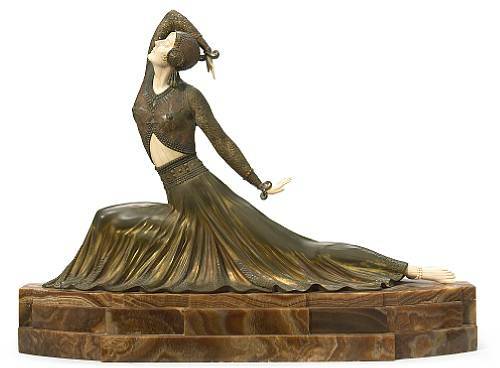 Other Art Deco bronze and ivory figures by Ferdinand Preiss were more conservatively estimated and sold well, most at or above the high estimates. 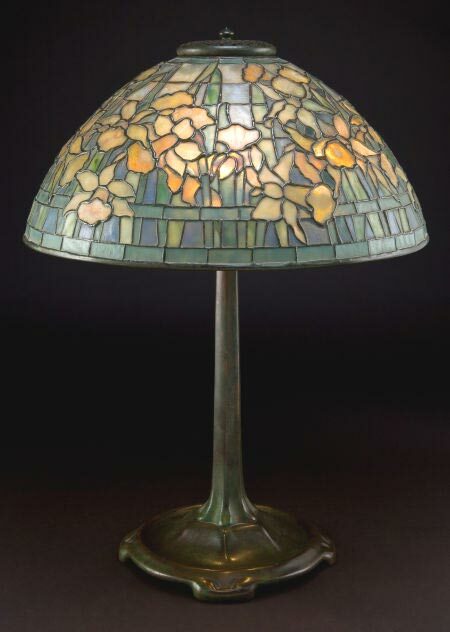 Other good results were a Tiffany Studios 20″ diameter Daffodil table lamp, lot #3073, $50,000; a gorgeous Tiffany Favrile blue decorated vase, lot #3029, $10,625; and a Gallé two-handled vase with leaves and a grasshopper, lot #3080, $11,875. For the complete results, click on the following link Bonham’s results. December is always a very busy month for antiques, mostly for buying, and not as much for selling. People get busy with their Christmas shopping and that doesn’t usually include a valuable antique. But sometimes it does, so I’m always ready to provide emergency service. If you still need a fine antique gift, I can work very quickly and so can UPS or FedEx. Among the many Tiffany Studios items I bought are vases — red, red decorated, Cypriote, millifiori, etc. For lamps, I purchased a 20″ Arrowroot, a 10-light lily and a 7-light lily. For miscellaneous, I have a Tiffany Studios pottery vase, lots of desk items, and an incredible Art Nouveau smoker stand with original enameling, unlike any I’ve owned before. The French cameo glass market, especially Daum Nancy, has been solid for years, and shows no signs of slowing. I recently acquired some fabulous items, including a very rare and beautiful farm scene, two rain scenes and an unbelievable collection of about 25 miniature vases. You can see everything I have for sale if you visit me at one of my winter shows. The first will be at Birchwood Manor in Whippany, NJ, the weekend of January 7-8, 2012. Then a week’s break and off to Florida for the start of our Florida circuit, first in Palm Beach (Jan. 20-22), then two in Miami (Jan. 27-29 and Feb. 2-6), and then back to W. Palm Beach (Feb. 18-21). If you can’t visit me at one of my shows, I’m always available by email, philchasen@aol.com, or phone, 516-922-2090. We can ship to anywhere from anywhere. Christie’s New York held an Interiors sale on December 8, 2011. Two lots that I was following had very interesting results. Lot #82 was a gray R. Lalique vase, entitled “Senlis”. I knew that Senlis was a very good model because it had bronze handles. 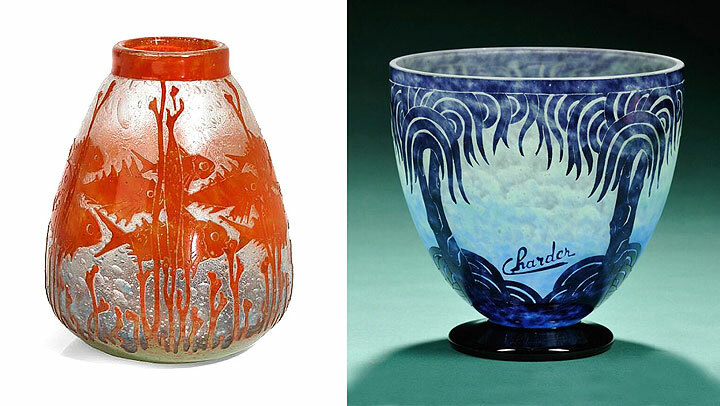 The problem was that I only knew enough about R. Lalique glass to be dangerous. 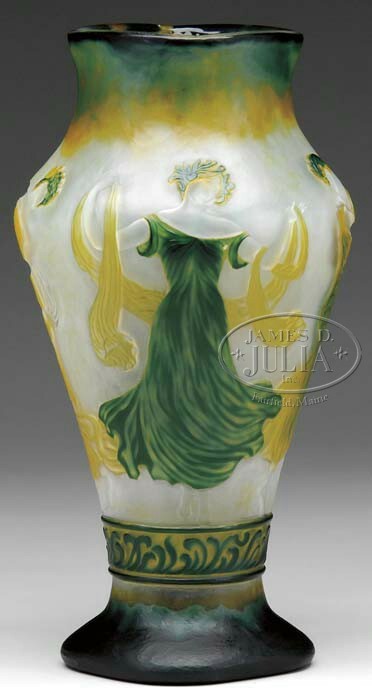 I’m not nearly as knowledgeable about Lalique as I am about French cameo glass or Tiffany Favrile glass. I hoped that perhaps it would go unnoticed and slip through the cracks. Wrong! Estimated to sell for $2,000 – $3,000, it sold for $40,000, including the buyer’s premium. I would have gambled up to $10,000, but not more since I didn’t really know the value. Obviously others did. 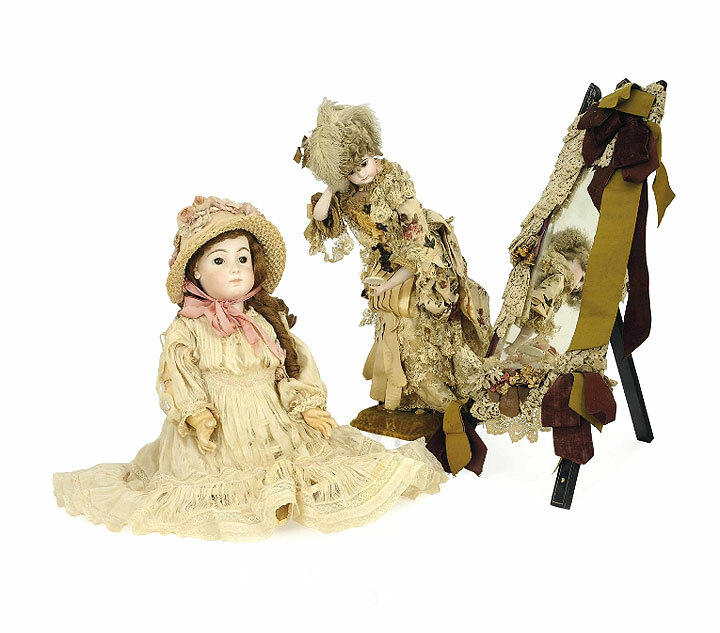 Lot #235 was listed as: A FRENCH BISQUE AUTOMATON DOLL STANDING BEFORE A CHEVAL MIRROR, with an estimate of $800 – $1,200. The lot was actually two dolls — one seated and the second an automaton with a mirror. Apparently the dolls were way better than estimated, as they sold for $20,000, including buyer’s premium. Again, I knew enough about dolls to be dangerous. Many years ago, I bought about 100 dolls from one collection and learned the basics from that experience. So I knew that to sell for $20,000, there had to be something else going on. I never had a chance to examine the dolls in person, but I suspect that one was made by an important French maker, like Bru, Jumeau or others. That would explain it. Knowledge is power. Need more proof? My goal is to publish new posts twice a week — Mondays and Thursdays. However, if you don’t see a new post on Thursday, it’s because I was too busy, so please look for a new one the following Monday. There will be a post this Thursday about of couple of nice surprises at Christie’s Interior sale. South Bay Auctions of East Moriches, Long Island held a Fine Art, Antiques & Sporting auction on Saturday, December 10, 2011. 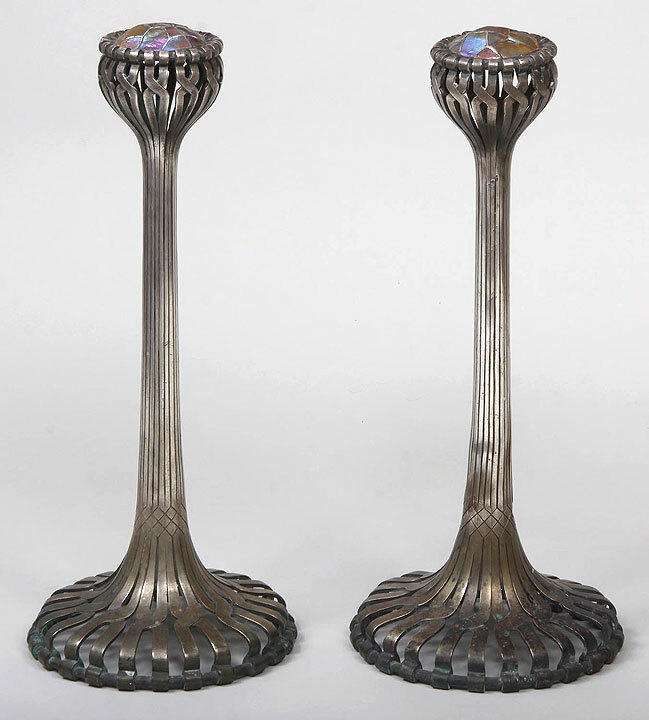 Included in the sale were a pair of andirons that were sold as lot #263, with the following description: Pair of Art Nouveau nickel plated bronze torchieres with iridescent stained glass tops, 23-1/2″h; one misshapen, loss to plating. No estimate was listed for them. It’s likely they were sold without reserve. Torchieres they weren’t, as there was no way they could provide light. Rather, they were nickel-plated bronze andirons. 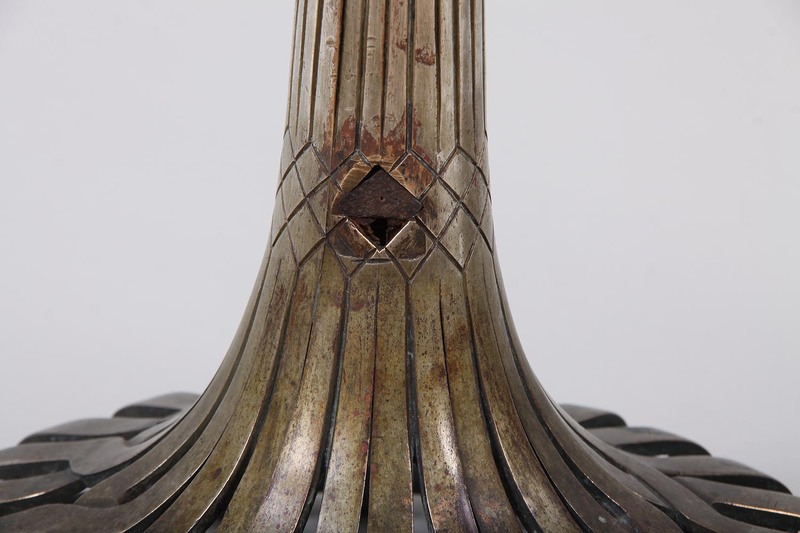 A detail photo of the back shows where the cast iron portion was originally inserted. It had been cut off somewhere in its history. The proof that they were Tiffany Studios was in the top — leaded turtleback tiles. Fabulous! 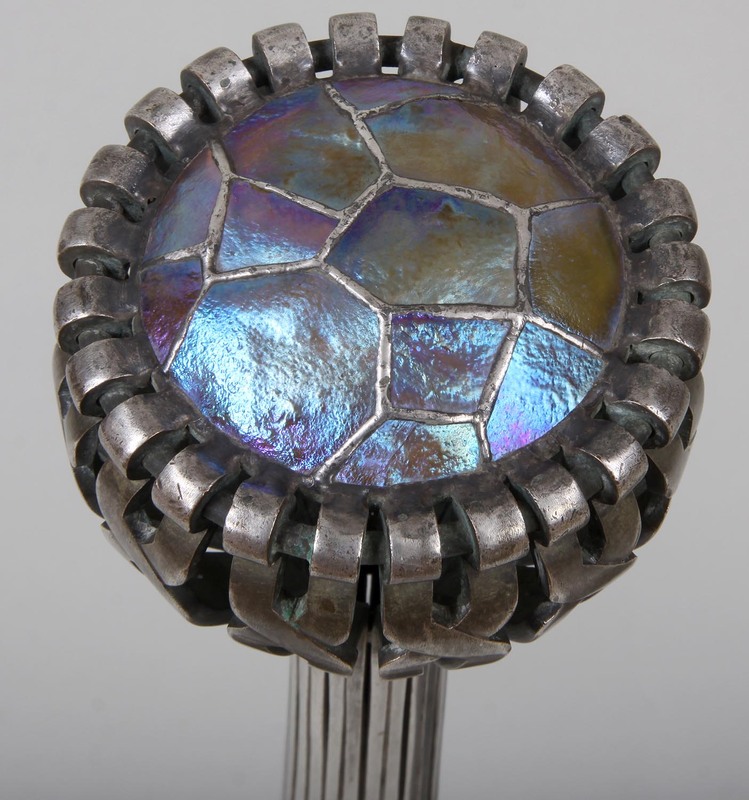 The quality, materials and workmanship all screamed Tiffany Studios. The andirons were unsigned, but Tiffany didn’t sign everything. Every once in a while, something got out unsigned. The bidding started at a few hundred dollars and continued in hundreds until about $2,000. Then a phone bidder jumped the bid to $5,000 (a failed attempt to scare off the other bidders). After a few thousand more dollars, the live audience dropped out and left the bidding to two determined phone bidders. Again the bidders jumped a few bids, until the final price of $28,000, for a total of $33,040, including the buyer’s premium. I’ve got a pretty good idea of who the bidders were, but that’s not for publication. In my opinion, if the pair were signed and in better condition, they could have brought double or more at a major auction house in New York City. In the meantime, I’m sure the consignor was thrilled with the result. Knowledge is power, and this item was another example. Every major and not so major auction house holds a 20th Century decorative arts sale in November or December. I’ll cover many of them this month. Today’s post will be about the results at Julia’s. My goal is to publish new posts twice a week — Mondays and Thursdays. However, if you don’t see a new post on Thursday, it’s because I was too busy, so please look for a new one the following Monday. 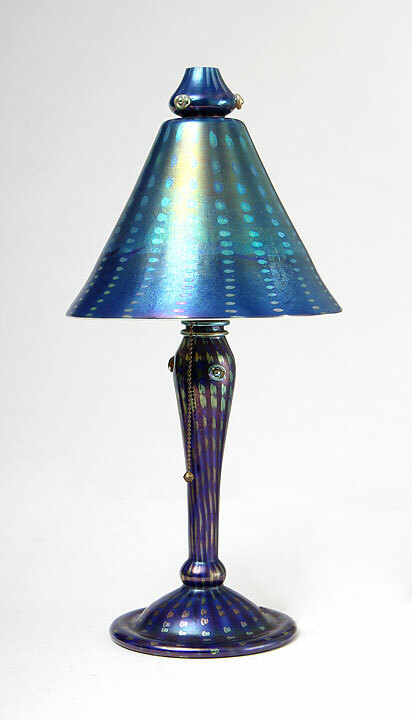 James D. Julia, Inc. held its semi-annual Important Lamp & Glass Auction on December 1 and 2, 2011, in Fairfield, Maine. The sale totaled $1.5 million, at the high range of expectations for the head of the department, Dudley Browne. As has been the case of recent, some categories performed better than expected and others faltered. There’s no clear pattern, so it’s difficult to extrapolate forward. Victorian glass, which had not done well recently, did well at this auction. Wedgwood Fairyland Lustre did poorly after doing well in the last sale. 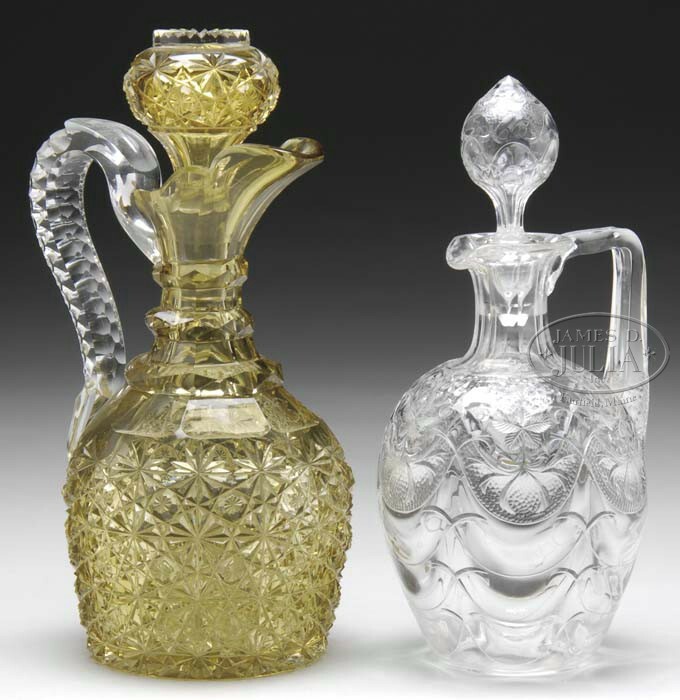 A pair of cut glass decanters, one of which was pale amber, sold for $22,425, against a pre-sale estimate of $200 – $400, over 100 times the low estimate. Apparently the amber one was quite rare. Nice home run for the consignor. The cover lot, a spectacular wheel-carved Eugene Michel French cameo glass vase, took off. Estimated properly at $10,000 – $15,000, it quadrupled its low estimate to sell for $47,150, including buyer’s premium. 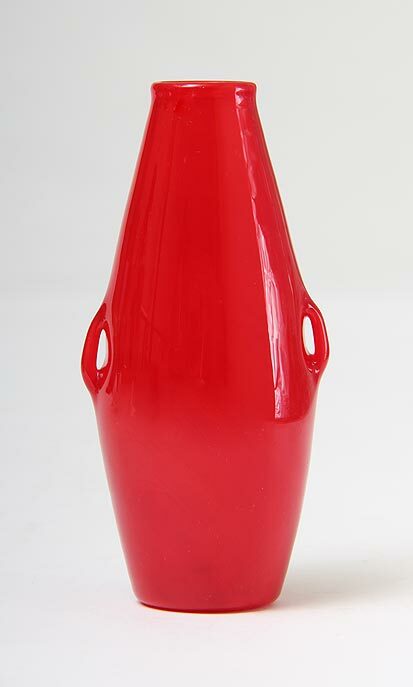 Michel vases can command high prices when the workmanship is super, and this one was super. At this sale, Daum did marginally better than Galle. The top lot of the Daum glass was a 25″ tube vase, decorated with roses, insects and applied cabochons. It sold for $13,800, including buyer’s premium, slightly below its low estimate. Much of the French glass in the sale was fresh, from a private Long Island consignor. Tiffany Studios watercolor sketches of stained glass windows did extremely sell, selling for 6 to 15 times their estimates. 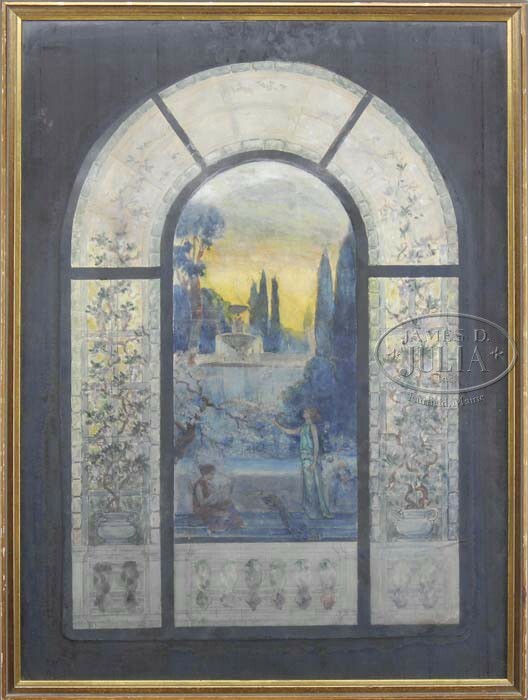 The highest price was paid for lot #3300, a watercolor sketch of a Tiffany window. It brought $18,400, against a pre-sale estimate of $2,000 – $3,000. 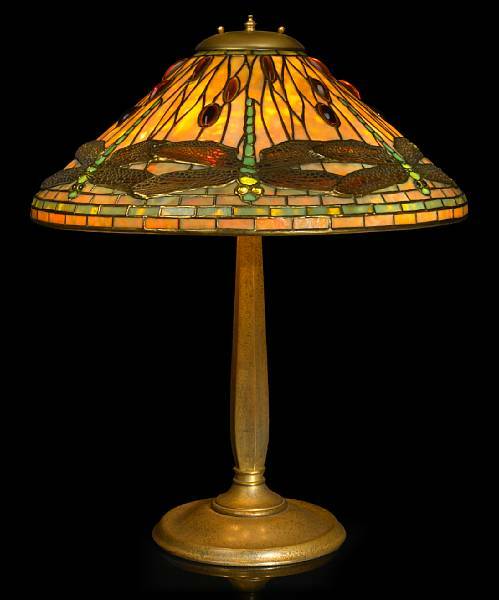 Tiffany lamps that were in the sale with aggressive estimates and reserves failed to sell, whereas most of the lamps with conservative estimates sold. For the complete results of the sale, click on the following link. You will have to sign in (free) to see the prices. Julia’s Important Lamp & Glass Auction results. Every major and not so major auction house holds a 20th Century decorative arts sale in November or December. Today’s post will be about the results at Heritage. I hope to be able to publish Thursday about Julia’s results. My goal is to publish new posts twice a week — Mondays and Thursdays. However, if you don’t see a new post on Thursday, it’s because I was too busy, so please look for a new one the following Monday. 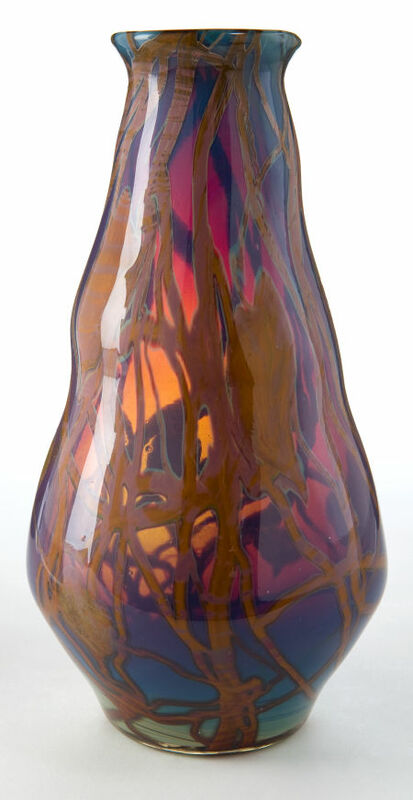 Heritage held its Art Glass Signature Auction on November 19, 2011 with excellent results. Top lot of the sale was a Tiffany 16″ Daffodil table lamp, lot #62001, received as a wedding gift in 1917 by the present owner. (How old does that make the present owner?) It realized a price of $56,762.50, close to the high estimate of $30,000 – $50,000. Second highest was a rare, fine Tiffany Favrile paperweight vase, 9″ tall. It was part of a consignment of fresh-to-the-market items that had been in storage since the 1940s. You can’t get fresher than that, nor better quality. Estimated very low at $3,000 – $4,000, it soared to $50,787.50. That wasn’t a huge surprise, considering the rarity and quality. 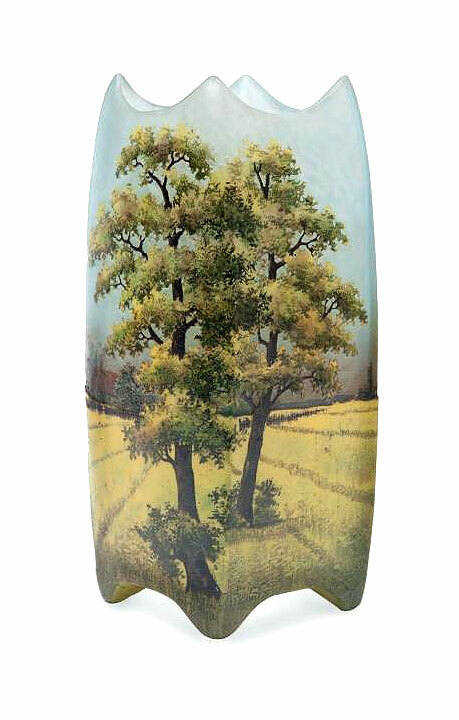 From the same 1940s consignment was a very fine artistic Daum Nancy vase, Orchides. 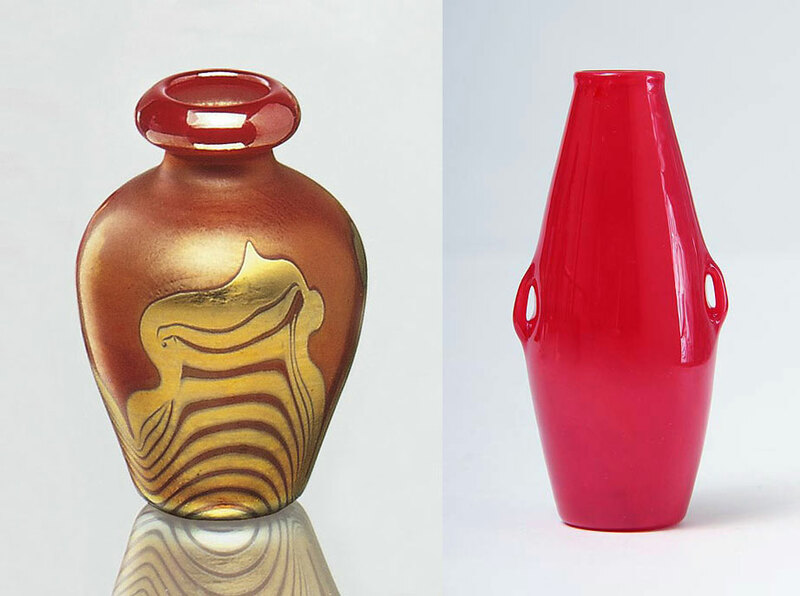 Artistic vases are one-of-a-kind, usually found in museum collections. The vase brought the highest price for French cameo glass, selling for $34,655, against a pre-sale estimate of $8,000 – $12,000. However, personally I thought the vase would do even better. My best guess is that the strange shape deterred some buyers (including me). Many other items did well in the sale, which grossed $1.84 million. For the complete results, click on the following link. Heritage Art Glass results. You will have to sign in (free) to see the results.